This annual event, attended by nearly 1,000 runners, walkers, kids and buddies supports local charities, including KEEN Greater DC. Along with the race and walk, the event also includes a buddy run. 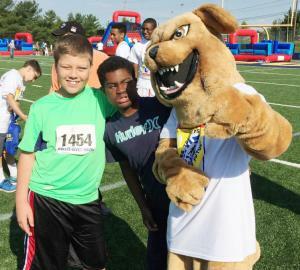 KEEN athletes, or young people with disabilities, are partnered with Bullis students to take part in this fun, inclusive activity together. In addition, participants enjoy a post race festival with entertainment, inflatables and pony rides. This event is the highlight of the year for many KEEN athletes. Thank you Bullis community for including the KEEN community in this amazing event!